First, how, exactly, are the caverns “lost”? If we look at variable encounter #13, the Hermit, we note several interesting things. First, the Lost Caverns are said to be south of a distinctive mountain known as Iggwilv’s Horn, and “there was much coming and going to and from the caverns” when she ruled there. There’s a notable landmark, a well-worn path, and it was the capital of a decade-long realm. How is it possible that such a center of a large empire was suddenly forgotten by every drover and ambassador that visited? We are told of the “cartloads of tapestries and rugs, statues and rare art objects have been recovered over the years as well as chests of precious metals, sacks of coin, and coffers filled with gems and jewelry.” So it’s very obvious that the place isn’t too hard to find. It’s been looted repeatedly in the past, although only one expedition that we know of made it into the deepest interior (as chronicled by the journal page that the hermit has; I think the fact that it ends with the word “beautiful” can only mean they made it through to the chamber of Drelnza, but it is admittedly speculation). Especially given the nearby demi-human enclaves (with their lifespans that would doubtless retain Iggwilv’s realm in living memory), it seems far-fetched that the caverns could remain unknown a couple of generations later. The downfall of Iggwilv and the destruction of her realm was at most 86 years ago. For a demi-human, that’s a flash in the pan, and even for a human, it’s within a couple of generations. And how could Iuz himself not know – surely he had visited his ally-and-mother’s headquarters at some point in the decade of their mutual rise. I submit that Iuz does know their exact location, and it is merely that his expedition found it too difficult to reach, and thus failed. Iuz himself could not go, lest he alert the powers of good who might seek to thwart him directly. But certainly something has happened to remove the exact location from general memory and record in so short a period of time. I think the module is setting up the notion that once the money ran dry, the looters stopped coming, and thus the location gradually became lost, but the demi-human issue just doesn’t make sense. It is certain that lggwilv ruled her domain from these caverns. There she also conducted arcane experiments and rituals, trying to further increase her powers. Either the intervening 86 years have completely wiped any trace of rulership and magical experimentation from the caverns, or something else is going on here. Perhaps we will uncover something as we press on. 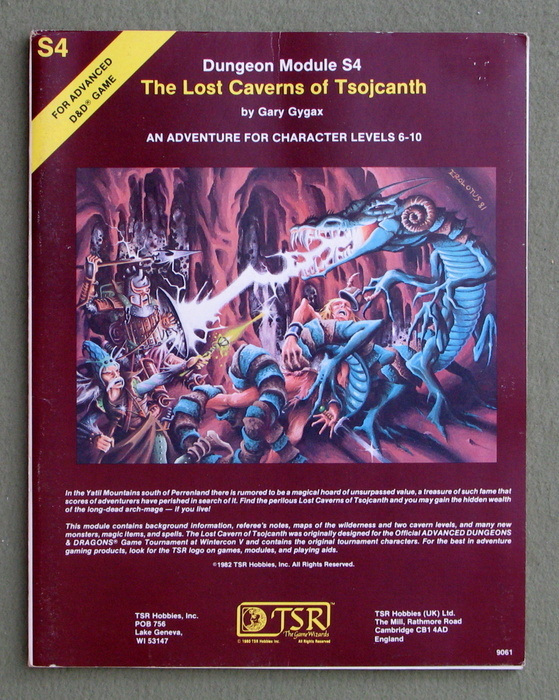 The first thing we notice when we look at the key for the lesser caverns is that the map (which is also counter-intuitively on the right side of the printed cover, even though it comes before the greater caverns to its left as printed) is apparently not complete. The first paragraph describes the actual entrance cave as being 70′ long, with a smaller cave beyond, and then another 60′ long tunnel with stairs. That’s a section more than half the width of the whole lesser cavern map that’s not shown. But ho! That’s not the only thing not on the map. Where the underground river enters the map, it’s possible to go up-river more than a mile, then reach a 60′ chimney before further progress is blocked by a lack of air. And where the river leads off the map, there’s another hundred feet before a waterfall that leads to a lake. In the Pool Cavern, we are helpfully advised that the DM could create an entire underwater level, should that suit his fancy, but no such thing is provided. At least there is a 900′ difference between the Lesser and Greater Caverns, which is more than enough space for such a sub-level without worrying about the impact of the water on the caverns below. And there is a group of Pech digging a stairway to “a large, sealed cavern” that they are certain exists above the Lesser Caverns. And that’s only the first level! As we’ve noted in other modules before, the entrance to the second level, where the interesting stuff is, is difficult to find. It’s tucked away in a difficult-to-reach corner that requires travel along the underground river, and which is hidden by a heap of boulders. But the PCs should be suspicious of what they’ve seen so far, which is, frankly, nothing more than a random selection of monsters with relatively meager treasures. The only hints of extra-planar doings are dao in the Richly Furnished Cave, the xorn in the Cave of Crystals, and the marid in the Pool Cavern. And nothing in any of those encounters particularly leads one to believe they are leftover occupants from Iggwilv’s experiments with extra-planar magic. There are most definitely no places in the Caverns so far that would seem a likely home to the rugs, rich furnishings, and huge treasures that have been hauled out over the years, but hauled out they were. Let us press on to the Greater Caverns in search of answers. Almost right off the bat, we see again that there are hidden areas of the dungeon that aren’t even represented on the map. Area #3 the Great Gallery Cavern stretches 160′ off the map to the east. Area #5 the Uneven Floored Cavern has a tunnel that slants down 40-80 feet and then runs for a mile, intersecting four more caves as it does so, before opening to the outside. Area #7 the Smooth Cavern has a sinkhole that goes down 150′ into an underground stream, with no other explanation or description. Area #9 the Glowing Grotto will teleport you into one of 4 different places, only one of which is mapped and one of which is outdoors on a different plane, while another is on an alternate dimension that “might be pat of the strong hold of a clerical order or a powerful magic-user, or anything else the DM wishes to create.” Area #16 the Great Cavern has a tunnel that goes for a quarter of a mile until it reaches a cave that opens up 300′ up the mountain. The point of all this is that this module is frigging ginormous, but only the central portion is actually mapped. While nothing explicitly states that our missing chambers and other infrastructure are in some hitherto-unrevealed section of the dungeon, given the need, and the apparent plethora of space unmapped, it’s not unreasonable to assume that what we’re looking for is off the map someplace. All this has, of course, been a prelude to the payoff for the adventure; area #20 The Inner Sphere (also called “the Nexus”, interestingly; surely a holdover from the original tournament module that mentioned a “planar nexus” even though there’s nothing remotely planar about the room). This is the spherical chamber at the heart of the Greater Caverns which holds Drelnza, Iggwilv’s vampire daughter, as well as her remaining treasures in the Caverns. Chief among these treasures, aside from the money and gems, are several artifacts: one of the six copies of the Demonomicon of Iggwilv known to exist, Daoud’s Wondrous Lanthorn, and one of the five Prisons of Zagyg. The purpose and genesis of this room are worth a bit of exploration and speculation. It’s tempting to say this was Iggwilv’s conjuring room originally. It’s impressively guarded, for one thing. 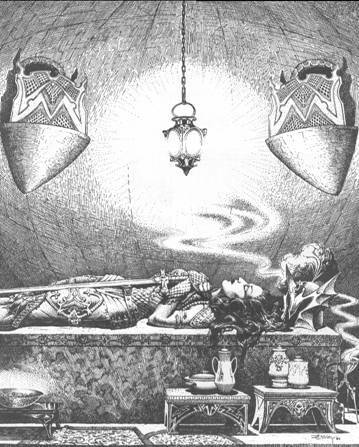 It’s also unlikely that it was created specifically to guard Iggwilv’s treasure after her battle with Graz’zt and her fall; if she had lost most of her powers in the fight, it would be difficult indeed to start creating such an impressive vault with its massive physical structure and magical protections. That assumes that Graz’zt was not imprisoned here at the time; surely the chamber would not have survived unscathed. So I imagine it thus. Iggwilv, having just slain Graz’zt and forced him back to the Abyss but having lost most of her powers in the process, scrambles to secure her greatest treasures against the day when she might regain her powers and be once more powerful enough to use them to begin her campaign of conquest once more. Her vampire-daughter Drelnza is enlisted as a willing guardian (if she was unwilling, she would flee in gaseous form as soon as the ebony doors were breached and she was able to escape). She scribes the curse-plaques on the demon tongues adorning the iron doors and flees to who-knows-where. Over the years the lesser and greater caverns are looted, and new monsters wander in through the multitude of entrances and making use of the complete lack of doors, while a few old residents (the genies, etc.) stay where they are, either because they are bound there by the remnants of Iggwilv’s magic, or by choice, making merry with the treasure-seekers who wander in from time to time. That’s all well and good for the present-state caverns, but I’m still vexed by the lack of any apparatus from which to rule an empire or conduct the sort of magical researches for which Iggwilv is famous. Or is there? Let’s go on the dual assumption that a) the Introduction is correct and this series of caves was indeed Iggwilv’s lair and the place where she conducted her magical experiments, and b) anything remotely portable has been long since carried off. Let’s turn back the clock and imagine what these caverns might have looked in their heyday (and let’s get that clear – this is all speculation and imagination on my part). Let us say that an ambassador from Ket has arrived to present his credentials and offer gifts, as ambassadors are wont to do. He will have journeyed through the Yatils along the well-worn path (which is also doubtless well-patrolled and guarded) to the entrance to the Caverns. In the Entry Caverns, he sees various tunnels, each flanked by a bas relief face of animalistic visage. But only one… the one near the southwest passage, will say “MY WAY IS THE RIGHT WAY” if it hears the word “truth”. Surely that is significant. What would be the “right way”? The way to Iggwilv. The other caves that depend from this one could house guards or even be used to house visitors. There’s enough space to be sure. He is escorted immediately through the southeast passage, where he walks down the Long Gallery, eventually coming to the throne of Iggwilv at its northern tip. The Witch Queen herself emerges from behind a curtain that masked her antechamber, now known as the Large Cave. They exchange the usual pleasantries, and he is eventually escorted across the Underground Lake via the magical boat to his guest quarters in the Cave of Crystals, which are finely appointed and glitter in the torchlight. Most of the “rulership” undertaken by Iggwilv from the caverns is in the form of messages to her lieutenants and captains. Iggwilv, however, retires to her personal quarters in the Greater Caverns. Specifically, the Cavern of Stalagmites (discreetly closed off by curtains or free-standing folding screens of the sort found in the Inner Sphere, and lined with carpets and finery like the Richly Furnished Cave), which is accessible only by passing through her guards in areas F and B. From here, she can easily access her teleportation zone in the Glowing Grotto, which leads the unknowing and unwary to various deadly detours, but Iggwilv is able to control its effect to take her to her magical laboratory; the Hall of Pentacles. Its various protective devices — magic circles, pentacles, thaumaturgic triangles, pentagrams, and so forth — are invaluable in controlling and capturing various extra-planar creatures. Indeed, it is here that the true center of her magical researches is to be found. Let’s go wild and speculate that it could even be located somewhere inside the Dancing Hut of Baba Yaga. Legend states that the arch-mage gained much of her prowess from discovering the Lost Caverns of Tsojcanth, wherein was hidden magic of unsurpassed might. I’m going to leave the quote there as it hits the vital point for me. What if the aforementioned “much of her prowess” came from a systematic study of the effects of those “malfunctions”? There’s a crystal bowl right there with more than a thousand gems of different types. What if they’re not there merely as a source of emergency wealth, but as a way to continue her researches using the Lanthorn (or fuel it for purposes she has already worked out)? The “standard” formulas use high-value gems which aren’t to be found in the crystal bowl. Maybe she figured out that less valuable gems can produce even more powerful, or at least odder, results? But there’s yet something else that’s very, very odd about the Lanthorn. The mysterious topaz lens. When the Lanthorn is found, it will have the following lenses with it: ruby, topaz, emerald, diamond, and the four crystal lenses. The three remaining gem prisms are elsewhere–possibly the object of a quest by player characters. All well and good, until we get to the list of the gem lenses, their effects, and their fuel costs. In that table, just a couple of paragraphs down, we have effects for ruby, oriental emerald, diamond, sapphire, oriental amethyst, jacinth, and three special combinations. Notably absent is topaz! One of the lenses that is found with the Lanthorn isn’t one of the lenses that produces a standard effect! We are, in fact, never told what the topaz lens does, but the mere fact that it exists and it is found with the Lanthorn tells me that Iggwilv’s power came from her experiments with the Lanthorn, and that when the description of the artifact says that “no original lenses can be made” that is a false statement. The mere fact that the Lanthorn comes with an original lense demonstrates so. And what are we told in the flyover country that is the section entitled “Reputed Magical Properties of Gems” waaaaaay at the back of Book 2? Topaz is said to ward off evil spirits. Like demons. We’re also given a list of gems and their properties that can be used to refuel the artifact. That’s just begging to be used to inform those “malfunctions” with different gem formulas for the fuel. Behold some of the ones that aren’t in the regular list of fuel-gems: chrysoberyl (protection from possession, like demons do), jacinth (luck for travelers, wards off plague, protection from fire – helpful against daemon lords and arch-devils), peridot (wards off enchantments). There’s a lot that could be used by an inventive DM. I’m still not enamored of the adventure as a whole. There’s very little that directly ties it to the Greyhawk setting outside the Introduction. We got some nice synchronicities in the dates of Iggwilv’s fall and the end of Iuz’s expansion, and there are some hard-won hints about the Lanthorn, but on the whole the adventure seems to betray its origins as a “gilded hole” tournament adventure. Still for all of that, there are some great nuggets to be mined here. I hope you’ve enjoyed this latest deep dive as much as I have. He posited that the Lost Caverns are not in fact Iggwilv’s main lair, and that latter lair was the place from which the various wagonloads of treasure mentioned in the introduction were found. His view was that the Lost Caverns were more of a place where Iggwilv hid some of her most precious treasures (and it stands to reason that Tsojcanth, whoever he/she is, did the same thing-if it works for them, it works for Iggwilv too). That said, I do like your theory about Iggwilv using the Caverns as a lair where she could impress visitors both from surrounding human lands like Ket, and probably also visitors from other planes of existence. Maybe some of these latter visitors came through the Glowing Grotto. And given that various otherplanar creatures like genies still come here, it’s entirely possible that they were the ones who took a lot of the fine furniture Iggwilv would have filled this place with back to their own planes. Other items might have rotted away or been destroyed in the roughly 86 years since the Caverns were vacated. I also really like your theory about the Glowing Grotto being a portal to the demiplane where Iggwilv kept her laboratory, library and magical arcana. It might also be a way she could easily travel to meet her minions, all while keeping the exact location of her own home secret. As for what magic Iggwilv might have found in the Caverns to conquer Perrenland, the Lanthorn might have only been one of those artifacts. It’s entirely possible that Iggwilv might have found other magical treasures that she shared with Iuz (helping to explain the latter’s rise?) that are still in her laboratories, or that Grazz’t might have gotten his claws on before Iggwilv defeated him and which he took back to the Abyss. Good read Joe! I think modules like these beg for expansion of the kind that TSR might have been ill able to spend time on when this adventure was published. What a deep analysis! And what a way to break childhood adventure memories! Just kidding. It felt as if you took a Disney movie and broke it down to pieces to see what makes no sense. The ambassador idea is a great way to imagine how the location was used in its heyday. Good stuff. I’d almost wish you next analyze S2 White Plume Mountain, but fear you might kill one of my favorites!